Videos : Tkachuk hilariously mocks Kassian as bad blood boils between Oilers and Flames. Tkachuk hilariously mocks Kassian as bad blood boils between Oilers and Flames. Tkachuk up to his usual antics. He may be one of the most universally despised players when it comes to the feelings of his opponents but there's no doubt that from a pure entertainment perspective notorious Calgary Flames agitator Matthew Tkachuk knows how to play the game. Tkachuk and his Calgary Flames were in Edmonton on Saturday night to take on provincial rivals the Edmonton Oilers in what has been affectionately dubbed the Battle of Alberta. As has always been the case in recent history the tensions between these two teams were riding high on Saturday night and the game had what could only be described as a playoff atmosphere. I suppose it should come as no surprise given that both of these teams are fighting for playoff positions, albeit in very different ways. As a result of the tensions between these two teams this was a game that produced a number of quality highlights on both ends of the ice, but perhaps the most amusing moment of the game came between two unlikely characters. Although, as I mentioned already, Tkachuk can be highly entertaining he usually needs a foil of some type to truly shine. I'm sure many fans will be well aware of his rivalry with Los Angeles Kings defenseman Drew Doughty and the fireworks that particular clash of heads has produced and on Saturday night he found another perfect foil in the form of Edmonton Oilers enforcer Zack Kassian. Kassian and Tkachuk got into it at a number of different times during the game but it was one incident in particular that truly had fans laughing at the absurdity of it all. After a scrum along the boards both and Kassian found themselves staring at one another and it was not very long before both men were letting their gums flap, I'm sure saying nothing but very nice things about one another. Tkachuk seemed amused by the whole thing but as he began to skate away he looked back to see Kassian still yelling at him, and that's when he decided to kick his taunts into overdrive. 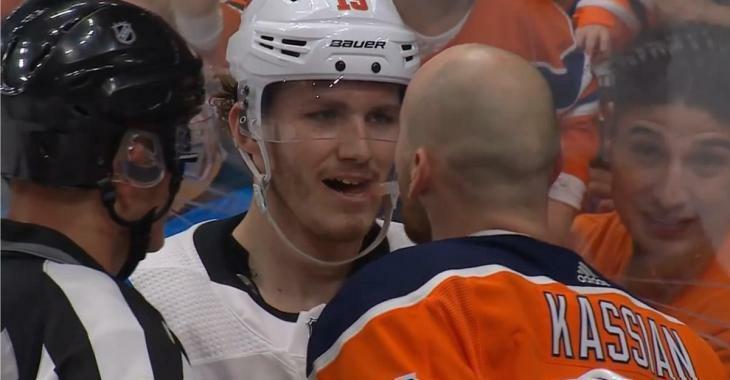 Tkachuk could be seen visibly mocking Kassian's mannerisms and although he seemed very amused by his jest it almost looked as if Kassian himself couldn't help but laugh as he was escorted away by an NHL official. It's hard to make out Kassian's face because of the camera angle, but as he skates away it really does look like he has a huge smile on his face.